11-16-04: We are officially moving for to a new home, to http://pikaworld1.envy.nu/, thank you. For your support, the new Poke-dex link is now up! 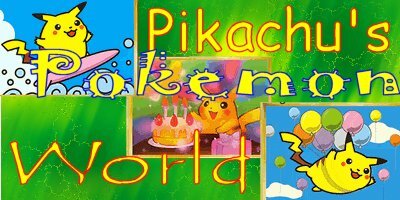 I now want to formally announce, that Pikachu's Pokemon World will be negotiating with ::Pokemon Land:: to form an alliance, we will keep you updated with all the inforamtion asap. There is no definite, alliance just yet. And finally check the TV Guide for this week's episodes. This week's Pokemon is Pikachu. This week's Pokemon Card is the Pikachu from the Base Set. 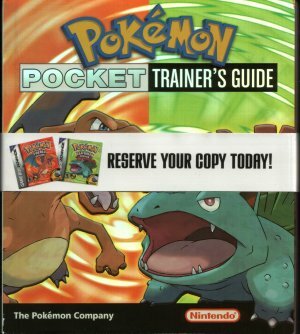 January 25, 2005: Pokemon Advanced Volume: 7 & 8 releasal. February 22, 2005: Pokemon Master Quest Box Set 2 releasal. April 2005: Pokemon Emerald releasal. 3:00: Pokemon! I Chose You!